SuckleBusters Original BBQ Sauce wins 8 Major Awards from: Chile Pepper Magazine, Fiery Food Challenge, Best of the Best BBQ Sauce Contest, Scovie Awards, National BBQ Associations BBQ Sauce Contest and 2 Years running - 1st Place at the American Royal - World Series of BBQ Sauce Contest. SuckleBusters Original is the winningest BBQ Sauce in Texas! Our all-natural, vinegar based BBQ sauce is Sweet, Tangy & Spicy. It has very slightly smoke flavor plus a little kick of heat and is an excellent all-around BBQ sauce. Great for Grilling! Use it on barbecue beef, briskets, steaks, ribs, chicken, sausage, pork, seafood, turkey or any grilled food to bust out a good barbecue flavor. Baste it on during the last few minutes of grilling to create a sticky-sweet layer of barbecue flavor or pour it on just before serving. It makes a great dipping sauce and kids love it too! Frankly, this is the best BBQ Sauce made in Texas. 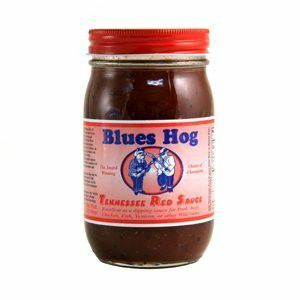 Vinegar, water, brown sugar, tomato paste, pure cane sugar, natural smoke flavor, salt, spices, xanthan gum. NO MSG. Naturally Gluten Free. SuckleBusters Original BBQ Sauce is on of our favorites!